This is my first Pink Saturday and I wasn't sure exactly what to do. I have been working on getting my studio organized and the way I would like. I have loved this statue I have for many years but it has been in a buff/beige color, which to me is just a little to "blah"! So I got some paint out and made it "Pink"! Sorry I was a little late in getting this up. I was having technical issues!! I love the figurine, it looks beautiful painted pink. Of course, I'm partial to pale pink. You did just fine getting your pink feature up for today. The pink color really made a big difference in the figurine. I like it much better too. I have countless items that needed a little je ne sais quoi & they ended up being real treasures. Great job on fixing up your figurine. What a lovely shade of pale pink! I'm your newest follower...I hope you stop by & if you like what you see - follow along as well. Thank you for sharing this pretty in pink! Happy Pink Saturday. Hi Lisa, Your statue is very romantic and I like it in pink. It looks great. Welcome to Pink Saturday. I am still visiting today. The list is long and I enjoy viewing what everyone shares. Welcome to Pink Saturday. Sorry I'm a bit late getting around. A lovely post. It looks perfect in pink. 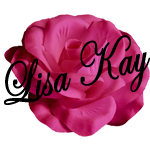 Welcome to your first Pink Saturday, Lisa Kay. I am glad you decided to join us. Your statue is lovely, and the soft pink color makes it so romantic.